For the last decade, mobile phones have been the fastest growing segment of the technology market increasing the importance of interface design for this type of device. Yet, many of the assumptions about user interactions that the authors know from “traditional” computer usage do not hold true for mobile devices and more specifically for touch-screen phones. A key question is, if usability heuristics tailored to this type of device exist. To answer this question, they conducted a systematic literature review. The authors analyzed the encountered sets of heuristics by mapping them to Nielsen’s ten heuristics and identified additional ones specifically proposed for this kind of device. Their review indicates that research findings with respect to usability heuristics for mobile phones are still extreme sparse. Most of these heuristics are strongly based on “traditional” ones, not considering comprehensively mobile phone characteristics concerning physical limitations, technology, usage goals, features as well as user characteristics and usage environment. Nevertheless, this article provides a general overview on the state of the art of usability heuristics for mobile phones. This can guide the design and evaluation interfaces for mobile phones as well as provide a starting point for the evolution of such heuristics taking into consideration more extensively the specific features of mobile phones. Mobile phones have world-wide become the most popular and widespread personal consumer device (ITU, 2011). These mobile phones that we now carry with us all the time have drastically evolved from a simple device to make phone calls to a complex interactive multimedia system with access to the Internet for a wide number of purposes. And currently, the percentage of smartphones – especially touch-enabled phones – is growing strongly worldwide (Lee, 2011). Yet, so far, we know little about “what works” in the interface design for mobile (touch) phones. 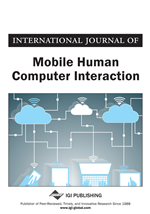 Here, we understand mobile (touch) phones as smartphones that offer a greater level of computability and connectivity than feature phones and, which allow interaction through a touch-sensible screen (Litchfield, 2010). Due to a lack of knowledge on this new kind of device, designers try to apply the best available knowledge from GUI or web-based interface design. But the question is to which regard this can be applied to the design problem at hand, as many of the assumptions about user interactions that we know from “traditional” computer usage do not hold true for mobile devices (Wasserman, 2010; Bertini et al., 2009). Clearly, the size and portability requirements of mobile phones present limitations as well as the awkward ways for input. And, although touch screen capabilities may facilitate certain actions, they also pose new challenges through the lack of tactile feedback, touch key size, etc. (Balagtas-Fernandez et al., 2009). Mobile phones also change traditional interaction models based on the familiar WIMP (Windows, Icons, Menus, Pointer) interface style to interaction that may involve voice, gestures, sensors and location data (Wasserman, 2010). Differences are also related to the environment, as mobile users will not be sitting quietly at a desk for a long time. They are rather on the go, walking down the street or waiting at the bus stop seeking to quickly complete simple tasks, retrieve information or to be entertained by assisting videos or playing games in environments where they will be surrounded by other stimuli. Interface design is further complicated, as, mobile phones are used by a wide range of people with different goals (Huang, 2009). Furthermore, the fragmentation of the mobile market contributes to a lack of consistency that makes mobile phones more difficult to use (Park et al., 2011). As a consequence, consumers are increasingly experiencing frustration with the usage of mobile phones. With the challenge of making the best possible use of touch phones considering these specific characteristics and limitations, user interface design takes on greater importance than ever (Wasserman, 2010). It is crucial to develop interactive mobile products that are usable, which means that they are effective and efficient to use and that they provide an enjoyable user experience. A way to conceptualize usability is in terms of design principles or heuristics (Preece et al., 2011). Usability heuristics represent general principles for the design of interfaces. A well-known example is the heuristic “visibility of system status” expressing that the system should always keep users informed about what is going on. Usability heuristics are derived from a mix of theory-based knowledge, experience and common sense. They are typically refined into design guidelines in style guides, which in a more detailed prescriptive manner specify exactly how to design an actual interface (for example, on how to design a particular icon) or serve as a checkpoint to evaluate the compliance of an interface design in order to identify potential usability problems. Usability heuristics, therefore, are intended to help designers to develop and improve the design as well as to provide a basis for evaluating prototypes and existing systems (Preece et al., 2011). In particular, they provide the framework for heuristic evaluation (Nielsen & Molich, 1990), a lightweight usability inspection method for finding usability problems at any point during the development process requiring little time and human resources.